We are happy to share with you the fourth edition of the Smart Mature Resilience newsletter. This newsletter is circulated quarterly with the latest project results, updates on project activities in cities and the latest news on critical infrastructure protection and city resilience. The SMR Resilience Information and Communication Tool is now functional and CITIES can now use the tool as end users. A prototype of the Resilience Information Portal is online at smr-project-test.appspot.com, which can give an example of how the portal can be used. The Portal is a web application on the cloud and is intended to serve as a toolbox, where cities can consider the software and communication systems they already use and choose elements and features of the toolbox to 'fill in the gaps'. Cities can begin to use the tool immediately. To gain a user name and password, please contact the SMR team. A tutorial is available here. Kristiansand in southern Norway is an SMR core city and hosted the project's first review workshop September 2016. Sigurd Paulsen of the city of Kristiansand, where the workshop takes place, identified water and waste as the security sectors of particular focus, and noted that the city is currently significantly investing in these areas. The city has worked closely with local research partner CIEM to provide comprehensive feedback and information on the city’s current communication practices in order to guide development of the tool and to optimize its potential for practical application. Paulsen noted that SMR workshops and networking have drawn attention to the need to build resilience within municipal administration and has also improved relationships and communication with city stakeholders, as well as spreading knowledge of resilience at national events, reaching national governmental actors. Kristiansand has also been able to closely cooperate with the city of Vejle through the project. A member of the city's fire department participated in the workshop, where the use of social media as part of communication with the public was explored in terms of the Resilience Maturity Model. Kristiansand is also working closely with Tier-2 partner of Vejle and both cities have found this cooperation to be valuable and informative as part of resilience-building in both cities. The Resilience Maturity Model comprises five maturity stages to guide cities through the optimal path of building resilience from a strategic approach. Each maturity stage contains a description of the objectives of that maturity stage, the stakeholders that need to be engaged in each stage in addition to a list of policies that should be developed in order to achieve the objectives defined in that maturity stage. A set of indicators have also been identified for monitoring and assessing the performance of these policies and justify their investments on resilience. The model has been revised and is now available for cities to use to self-classify their level of resilience development. This report demonstrates and highlights the main outcomes of the pilot implementation process, starting with the kick-off workshops, including webinars between the tier-1 and tier-2 partner CITIES, as well as the input received and the results of the review workshop in Kristiansand, Norway, on 21 September 2016. The first review workshop of the Smart Mature Resilience (SMR) project took place on 21st September 2016 in Kristiansand (Norway). The workshop focused on gathering feedback from the pilot tools testing process and collecting input on social media integration and scenarios for the Resilience Portal, which is integral part of the Community Engagement and Communication Tool. This report focuses on the Resilience Maturity Model explaining the methodology used to develop it and describing its maturity stages. This report presents design principles for the use of social network services to promote citizen engagement. This is facilitated by the task of integrating social media communication with citizens as part of the Resilience Information Portal. The Risk Systemicity Questionnaire can assess a given CITY’s risk and can also assist in determining a CITY’s resilience maturity level. The RSQ is currently undergoing pilot implementation. 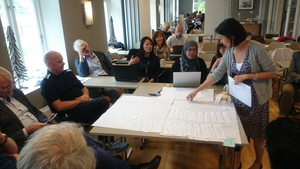 During testing of the tool in Kristiansand, the questionnaire took as its basis the topics of health and air pollution, and participants were presented with scenarios showing vicious cycles of risks, and were asked to consider how likely different risk scenarios, which form vicious loops, were to occur in their cities. Based on the responses, upon completion of each of the two sections of the RSQ, participants are given their own overall risk score (an estimated risk level for the city) and an awareness score (the level of knowledge the city has about the possible risks).